Triumph's Bobber is the fifth motorcycle from the new Bonneville line and perhaps the most niche model of all. The evolution is interesting because Triumph has the T100 and T120 models in the middle, holding down the full-retro theme that underpins the Bonneville line. 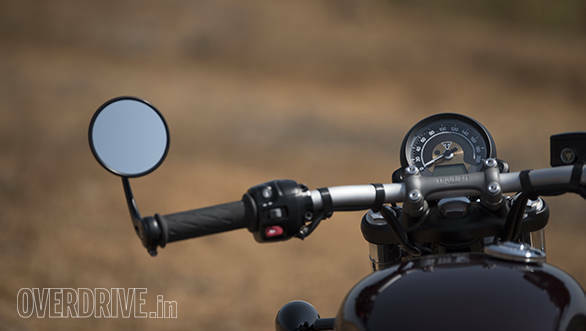 The Triumph Street Twin is retro-flavoured but not enough to not appeal to people who want a versatile naked. And the Thruxton R is unabashedly the most good-looking cafe racer we have seen in years. Nicely done. The Bobber is an outlier in this but I imagine that in the United States, it will be a lot more mainstream. My point is that, by design and nature, the Bobber is very focussed. The format removes the ability to do many things. But focus, when it comes to motorcycles, in my experience, is what makes for truly great motorcycles, not versatility. How focussed is the Bobber? Well, to build it, Triumph started with the new Bonneville platform but it led them so far from the base bikes. The Bobber is all-new and distinct from all the others for all practical purposes. So let's start with the engine. The engine, for instance, is the same 270° firing parallel twin as of the Triumph T120. The label below the fins, in fact, is the same too - 1200 HT (high torque, versus high power on the Thruxton). But the 80PS at 6,550rpm and 105Nm at 3,100rpm of the T120 change to 77PS at 6,100rpm and 109Nm at 4,100 rpm. 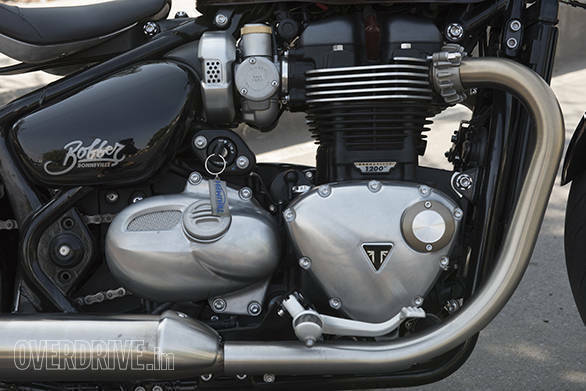 Essentially, Triumph made a fatter torque curve and traded in a few horses on top. But there's more, you see a custom bike maker could reach into a motorcycle like it were a plate of spaghetti and pull out handfuls of wiring and componentry to ensure that packaging of the bike was easy and clean. But a manufacturer cannot do this. So Triumph had to keep the performance goals as well as all the other stuff - ABS components, traction control equipment etc. Hard work. 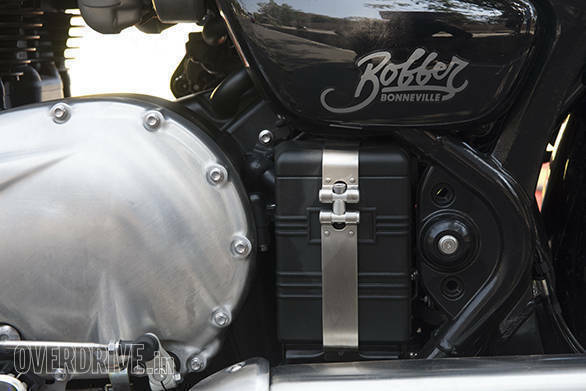 So the Bobber gets a split air box with two air cavities and two air filters, for example. And at the bottom you'll note the old-school battery box on one side and a fake "transmission" that is actually an aluminium-finish cover for the plastic coolant can. And it does have ABS as well as traction control. 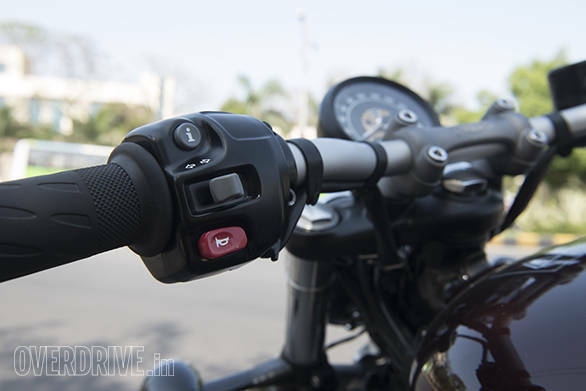 But in keeping with the nature of the motorcycle, the traction control can be turned on and off and has a Rain and a Road mode. And that's it. The frame sees significant changes as well. The T120 geometry is set to 25.5°/105mm with a wheelbase of 1,445mm. The Bobber is more relaxed. 25.8°/87.9mm and a wheelbase of 1,510mm. What those numbers mean is a slower-steering motorcycle where big movements at the handlebar will feel like they want to flop to the steering stops. And the longer wheelbase means it will feel like it needs more lean to make the same direction change. All of that is consonant with how a bob-job is expected to feel, except that the Bobber delivers more than the spec sheet promises. But let's start with that it doesn't do. 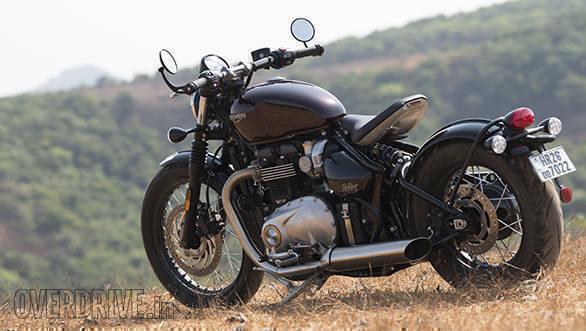 The Triumph Bobber cannot be accused of being the most comfortable of all motorcycles. The clever little seat is the reason for this. It looks terrific and the brushed metal finish on bottom of it is so classy. It's also clever, sitting on a sloping tongue of metal which allows you to move it lower and backward, or forward and up. But in the same breath, the nature of the construction means that Triumph cannot make a thickly padded seat. Now, I am a fan of hard seats and I didn't mind the seat too much. But I don't think this is an eight hours in the saddle type of motorcycle. 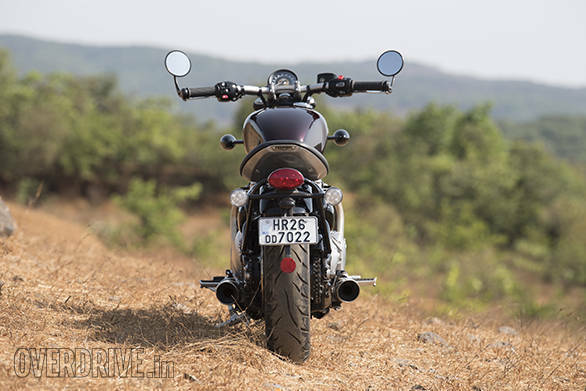 Let us understand the hardtail-lookalike design and you will see why there will never be a pillion seat on the Bobber. You see, the Bobber hides its rear shock under the seat. And instead of the usual swingarm, you have a cage that holds the rear wheel. This cage is made of the upper diagonal element that visually connects the rear axle to the headstock. The lower element gets hidden by the slash-cut exhausts. On these are mounted the rear fender with the stay and the tail light cluster. What that means is that the fender, tail lights and what have you are all mounted on the swingarm. As you can imagine, mounting anything to the swingarm of a motorcycle is firstly going to affect the handling badly and second, you should never ask your significant other to sit on the swingarm. That won't end well. The point is that the Triumph is a strict single-seater. It also means by extension that should you decide to leave for a cross-India tour on your Bobber, you're looking at wearing a giant rucksack or a smaller backpack with a tank bag. 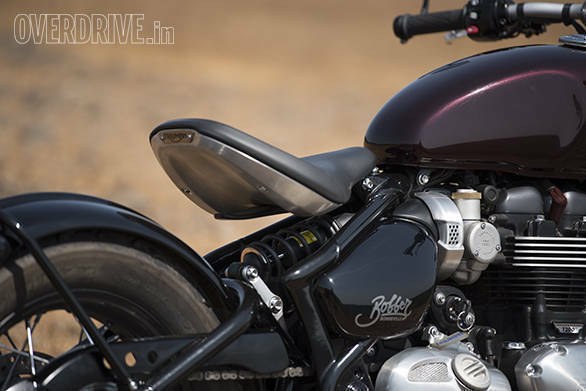 The Bobber will cross 180kmph if you really keep the gas pinned. I saw over 160kmph easily on a couple of occasions during testing too. But two things. First, the lovely, smooth rumble of the engine note changes at 4,000-4,500rpm. It becomes more urgent and it accelerates very well too. But the engine isn't the issue. The chassis is. There's not a lot of suspension travel and that means unless the roads are super smooth, you will be very uncomfortable when you turn the speeds up. Bumps will come through to your spine, and it is possible to bottom the suspension fully when, for instance, find a crest that you weren't expecting. Don't ask how I know this. And now, for the bits that the Bobber really nails. How can a motorcycle with such small ground clearance, a low ride height and a small amount of suspension travel have good ride quality? Well, I honestly don't know, but it does. After a fashion. You see the Bobber likes it low and slow. So if you moderate your speed, this is a fine ride. 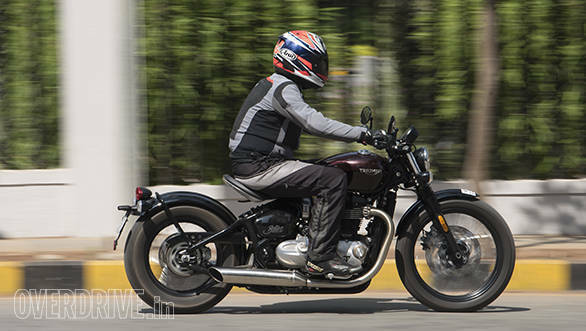 Luckily, the change in the engine note, the heavy-handed way the traction intervenes and the suspension conspire to ensure you understand how gloriously sweet the Bobber feels in its sub-120kmph sweet spot. You will always know instinctively to go back into that zone no matter what kind of rider you are. It's that feeling that tells me that if I had a Bobber and I intended to commute to work every day on it, I'd be a happy camper because 120kmph is already well past the kind of speed you would do on urban roads. Yes, that's in the good things column too. Surprise! The Bobber is supposed to feel long and unwieldy but it doesn't. Not even at walking speeds in heavy traffic. It feels short and controllable and you will rather like it. On a mountain road, the Bobber will surprise you. I wasn't expecting a motorcycle with this long wheelbase, this much weight, a 19-inch wheel and lazy-by-design steering to feel so easy. But it is. The Bobber tips over to the pegs easily and only in quick direction changes do you notice how much effort the bars require to pick up the bike and lean the other way. This is commendable engineering. The Bobber looks fantastic. There are so many angles from which this is an arresting motorcycle. Even the dark, subtle hues of our maroon and black motorcycle drew every glance as I swanned about during the test. Not only has Triumph nailed the proportions, but the level of detail in each part of the motorcycle raises your sense of how special the Bobber is. 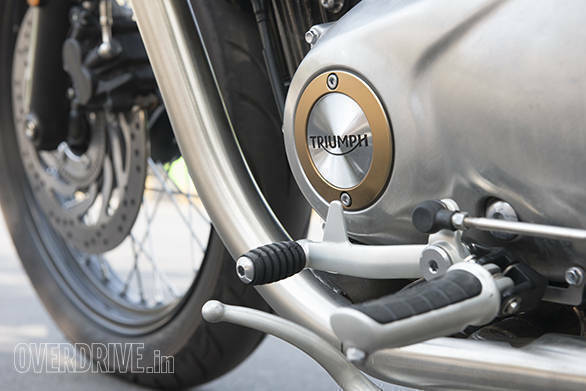 There are only a couple of touches of matte gold on the Triumph Bobber but they are used so well! Whether that is the stainless strap over the battery box or the central rib on the rear fender, this is a fascinatingly correct Bobber to the eye. 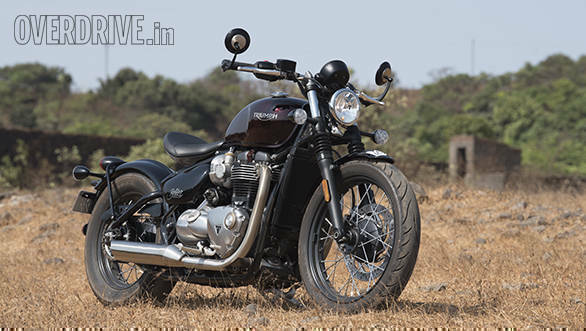 Zoom out and the Triumph Bobber glows with incredible presence for such a simple motorcycle. 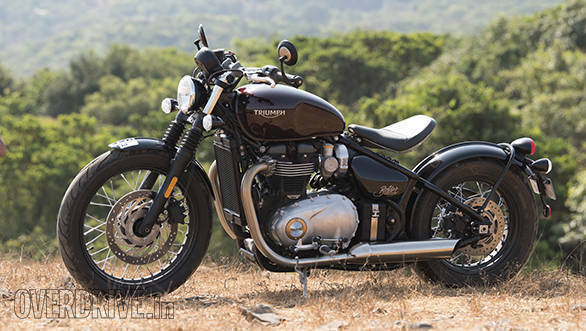 At Rs 9.09 lakh (ex-showroom, Delhi), the Bobber is priced at Rs 30,000 more than the T120 and Rs 1.9 lakh below the Thruxton R. That is a good price, all things considered. The Bobber isn't going to appeal to everyone. 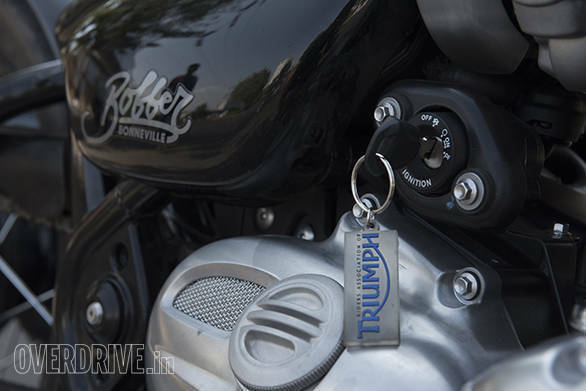 In fact, it sits in a very specific niche and that little pigeonhole does restrict what the motorcycle can do well. 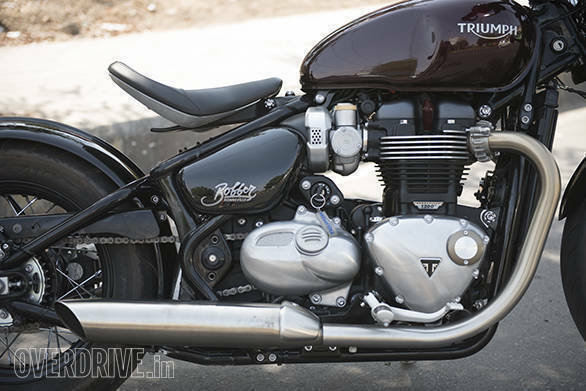 Although full credit to Triumph for making the Bobber do great things despite. But here is the thing. 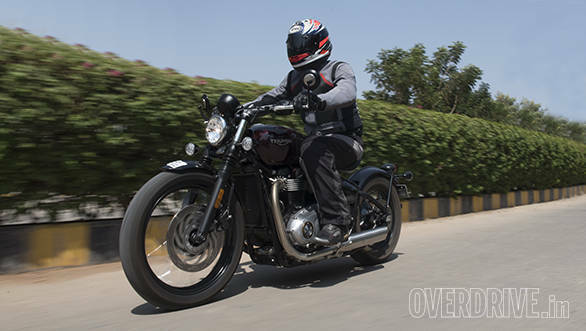 Most people who ever ride the Bobber are more likely to be happier with the T120. It's the more versatile motorcycle, utterly refined, very consciously old-school and a lot more capable in general than the Bobber, this is without question. The Bobber's appeal is different and specific. It's a 1,200cc motorcycle that takes going slowly very seriously. I would laugh at the idea if I hadn't just put two days of saddle time in. Stick to its brief - below 120kmph, low and slow - and this is a marvellous motorcycle. It rumbles along like a smooth Harley might, and there's enough ride quality, refinement and handling for you to feel really happy with yourself. 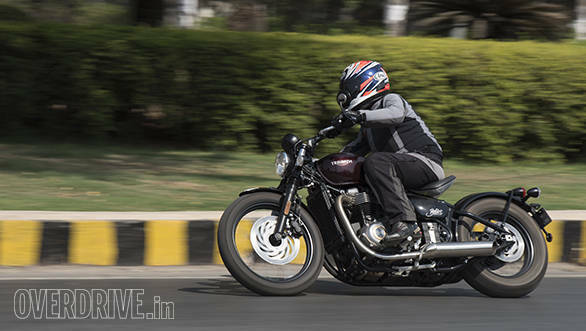 But you should know that despite the good economy and all, the format, the 9-litre fuel tank and other elements of the Bobber mark it out as a strictly city and weekend ride type of motorcycle. If that's what you're looking for, a good bobber-style motorcycle to swan about, this Triumph is exactly what you need. The hard part might actually be to tell your significant other that you intend to spend Rs 12-14 lakh on a motorcycle that only you are going to get to ride. Then again, maybe that (finally) convinces your partner to go out and get that motorcycle licence, eh? The bobber as a motorcycle type originates in the USA. It is crucial we understand what that means before we dive into Triumph's excellent interpretation. Because like almost everything else, the bobbed bike is about perspective. Conventional wisdom says the bobber appeared in the '30s. Harley's J-Series V-twins had grown old and slow, and the bobber style was born from the need to go faster. Three things identified the style. Just like the racers of the time, the front fender would be eliminated. Then the rear fender would be shortened (bobbed, hence the name) and all excess bodywork removed. And finally, what slowly became a signature was the shortening and lowering of the frame so that there appeared a dramatic line that directly connected the headstock to the rear axle. But if you think of the Triumph Bobber at 238kg (dry!) as a performance bike, you'll need a box of tissues to wipe your eyes dry after you finish guffawing. And there's the need for perspective. Because a 238kg motorcycle is a performance phenom when it competes with a 400kg motorcycle. And today, the Bobber isn't a performance motorcycle as much as it is a dramatically visual motorcycle.